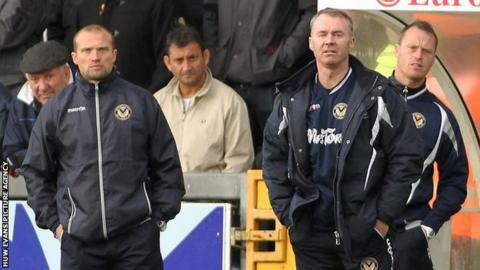 Newport County should appoint Warren Feeney as their new manager, according to departing boss John Sheridan. County are expected to announce their new management team on Friday, with Feeney set to take the main role. Feeney was assistant to Sheridan, who is the new manager of Oldham. "I'm really hoping Warren Feeney gets the job because he's got a great attitude and a good work ethic and he wants to do well himself," Sheridan told BBC Radio Wales. Feeney, who joined from from Linfield on 6 October 2015, will be assisted by Mike Flynn and Sheridan believes the duo can keep Newport in League Two. "He's an ideal replacement and would leave Newport in good hands," he added. Sheridan succeeded the sacked Terry Butcher at Newport in October, 2015, and believes the players would endorse Feeney's appointment. "He's good with the players as well and, with me leaving, I think they'll want Warren to get the job because they know him well and they respect him," he said. "He's hard working, he'll have his own ideas and I think he's got all the attributes to be a good manager." County were upset at the nature of Sheridan's departure. A statement on the club's website said: "Whilst John leaves with our best wishes, we are disappointed with the way that Oldham Athletic have conducted themselves during this process and are considering our position." However, Latics chairman Steve Corney praised the Welsh club. "I would like to take this opportunity to add my thanks to Newport County who have dealt with this situation in a professional manner," he said.